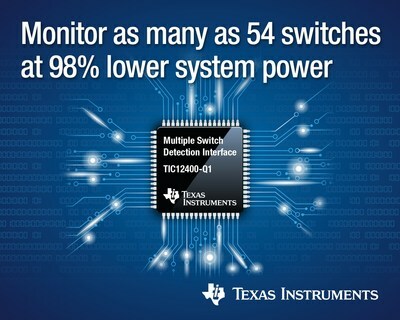 DALLAS, Oct. 10, 2017 /PRNewswire/ -- Texas Instruments (TI) (NASDAQ: TXN) today introduced two multi-switch detection interface (MSDI) devices that consume up to 98 percent less system power than conventional discrete solutions. The TIC12400 and TIC12400-Q1 are the first switch and sensor monitors that directly interface with resistor-coded switches. For more information, see www.ti.com/TIC12400Q1-pr.